Nerve gases, or nerve agents, are mostly odorless compounds belonging to the organophosphate family of chemicals. Nerve gasses are either colorless or yellow-brown liquids under standard conditions. Two examples of nerve gases that have gained some notoriety through their powerful physiological effects are Sarin and VX. Even in small quantities, nerve gases inhibit the enzyme acetylcholinesterase and disrupt the transmission of nerve impulses in the body. Acetylcholinesterase is a serine hydrolase belonging to the esterase enzyme family, which acts on different types of carboxylic esters in higher eukaryotes. Its role in biology is to terminate nerve impulse transmissions at cholinergic synapses. It does this by rapidly hydrolysing the neurotransmitter, acetylcholine, which is released at the nerve synapses. Inhibition of the acetylcholinesterase results in the excessive buildup of acetylcholine in, for example, the parasympathetic nerves leading to a number of important locations in the body: the smooth muscle of the iris, ciliary body, the bronchial tree, gastrointestinal tract, bladder and blood vessels; also the salivary glands and secretory glands of the gastrointestinal tract and respiratory tract; and the cardiac muscle and endings of sympathetic nerves to the sweat glands. An accumulation of acetylcholine at parasympathetic sites gives rise to characteristic muscarinic signs, such as emptying of bowels and bladder, blurring of vision, excessive sweating, profuse salivation and stimulation of smooth muscles. The accumulation of acetylcholine at the endings of motor nerves leading to voluntary muscles ultimately results in paralysis. Nerve gases are highly toxic, stable, and easily dispersed. They produce rapid physiological effects both when absorbed through the skin or through the respiratory tract. They are also fairly easy to synthesize and the raw materials required for their manufacture are inexpensive and readily available. This means that anyone with a basic laboratory can produce them. Nerve gases are, therefore, a significant concern for authorities as they are an easily available weapon for terrorist groups. Cold War-era artillery shells containing GB nerve gas are carefully loaded into a steel cask for transport to an incinerator at a chemical depot in Utah in 2001.
agent against insects. Schrader found that as little as 5 parts per million (ppm) of Tabun killed all the leaf lice used in his experiments. Soon after Schrader's experiments, the potential use of this substance as an agent of war was realized. In 1939, a pilot plant for Tabun production was set up at Munster-Lager, near the German Army training grounds at Raubkammer. In January 1940, Germany began the construction of a full-scale plant, code named Hochwerk, at Dyernfurth-am-Oder (now Brzeg Dolny in Poland). A total of 12,000 tons of Tabun was produced during the ensuing three years (1942–1945) and at the end of WWII, large quantities were seized by the Allied Forces. In addition to Tabun, Schrader and his colleagues produced some 2000 new organophosphates, including Sarin in 1938 and the third of the "classic" nerve agents, Soman, in 1944. These three nerve agents, Tabun, Sarin and Soban, are known as G-agents. 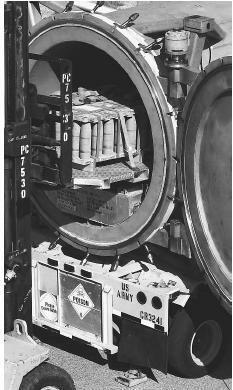 The manufacture of Sarin was never fully developed in Germany and only about 0.5 tons were produced in a pilot plant before the end of WWII in 1945. After 1945, a great deal of research began to focus on understanding the physiological mechanisms of nerve gas action, so that more effective means of protection could be devised against them. However, these efforts also allowed for the development of new and more powerful agents, closely related to the earlier ones. The first official publications on these compounds appeared in 1955. The authors, British chemists Ranajit Ghosh and J. F. Newman, described Amiton, one of the newly developed nerve agents, as being particularly effective against mites. At this time, researchers were devoting a great deal of energy to studying organophosphate insecticides both in Europe and in the United States. At least three chemical firms independently studied and quantified the intense toxic properties of these compounds during the years 1952–53 and some of them became available on the market as pesticides. By the mid-1950s, following in the wake of the intensive research activity, a new group of highly stable nerve agents had been developed. These were known as the V-agents and were approximately ten-fold more poisonous than Sarin. The V-agents can be numbered among the most toxic substances ever synthesized. VX, a persistent nerve gas, was discovered by Ghosh and was touted as being more toxic than any previously synthesized compound. Since the discovery of VX, there have been only minor advancements in the development of new nerve agents. A contemporary use of nerve gas occurred during the Iran-Iraq war of 1984–1988. In this conflict, the United Nations confirmed that Iraq used Tabun and other nerve gases against Iran. This incident is a prime example of how the technology of chemical weapons was shared during the Cold War. The Soviets would arm their allies while the U.S. did the same for its allies. Iraq was a benefactor and implemented its chemical stockpiles during this period. Another contemporary incident of nerve gas use occurred in Japan in 1995. Members of the Aum Shinrikyo cult introduced Sarin gas into Tokyo's subway system. This incident gives an example of the possible new roles that nerve gases may play in the future, as tools of terrorism rather than the weapons of powerful nations. Paxman, J., and R. Harris. A Higher Form of Killing: The Secret Story of Chemical and Biological Warfare. New York: Hill and Wang, 1982. Poolos, J. Nerve Gas Attack on the Tokyo Subway. Rosen Publishing Group Inc., 2002. Stockholm International Peace Research Institute. The Problem of Chemical and Biological Warfare. A Study of the Historical Technical, Military, Legal, and Political Aspects of CBW and Possible Disarmament Measures. Vol. 1. The Rise of CB Weapons. New York: Humanities Press, 1971. Evison D, D. Hinsley, and P. Rice. "Chemical Weapons." BMJ 324 (2002): 332–335. Yergler, M. "Nerve Gas Attack." Am. J. Nurs. 1 (2002): 57–60. Lenthall, Joe. University of Oxford. "Molecule of the month, VX gas." < http://www.chem.ox.ac.uk/mom/vx/VX.htm > (February 20, 2003).